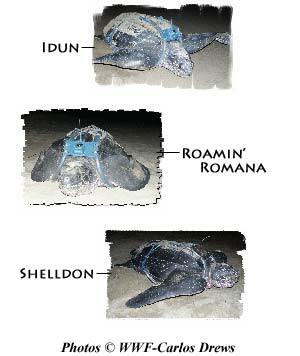 Following the Leatherback Sea Turtles! Leatherback Sea Turtles are the largest sea turtles, and named for their dark, leathery shell. They are also the most endangered sea turtle species, yet scientists still have a lot to learn about these animals. Dan Evans, Outreach & Field Programs Coordinator from our collaborating partner, the Caribbean Conservation Corporation & Sea Turtle Survival League explains that attaching satellite transmitters to the animals can tell us a lot about these elusive animals. "Most sea turtle research occurs on the nesting beach," explains Mr. Evans, "primarily because it's easy; the turtles come to you. It is much more difficult discovering where they feed and the pathways they travel between nesting grounds and feeding areas." Mr. Evans and his team are using the satellite tags to determine where the Leatherbacks go, what pathways they take, and what threats they might face in their travels. One issue of concern is longline fisheries. Unlike sharks, dolphins, albatrosses and other marine animals that are attracted to fishing lines baited with squid, Leatherbacks "investigate the lines out of curiosity, and are often hooked just swimming by," Mr. Evans points out. Conservationists are trying to modify the shape of the hooks used on longlines. These new hooks would prevent turtles from getting accidentally hooked as they swim by, but may not reduce the bycatch of other animals who go after the bait. The turtles can also be caught in shrimp or fishing nets. Although the nets now come equipped with Turtle Excluder Devices (TED's), until recently, these devices were too small to help the huge Leatherback turtles escape. Other than fishing, another major threat to these turtles is pollution. Floating plastic bags and helium balloons look like jellyfish, the Leatherback's prime food source. Many plastics discarded on land unfortunately make it into the ocean. Mr. Evans recommends that Signals of Spring students look closely at bathymetry data when analyzing the turtles' paths. Leatherbacks are the deepest diving species of turtle. By studying bathymetry and phytoplankton, students can identify areas of upwelling. These areas are often important for turtle feeding, as jellyfish and other food sources can be found in these productive zones. Mr. Evans also suggests learning about the life cycle of the jellyfish in order to understand where the jellyfish, and consequently the turtles, can be found. Students should research in order to understand what makes a good feeding ground for Leatherbacks. There is certainly a lot to learn about Leatherbacks. Keep an eye on them this spring; maybe some of your questions will be answered!